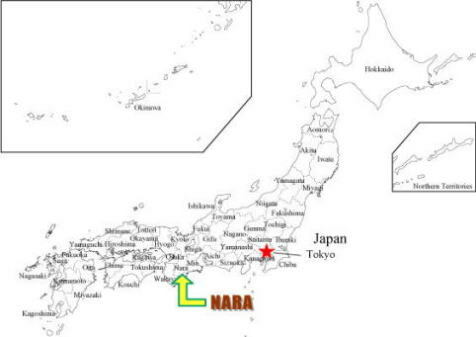 Nara became the capital of Japan in 710. About 1300 years later Nara was registered as world heritage. There are 8 historic monuments on the list. Following properties have constructions of National Treasure and the lands are designated as Historic Site. Todai-ji Temple, known for its 'Daibutsu-san' or Great Buddha, is a representative temple in Nara, with an imposing appearance of the largest wooden structure in the world. As the imperial ordinance by Emperor Shomu was issued for the construction of Great Buddha, the temple was erected under national sponsorship so that the Great Buddha would be enshrined. The consecrating ceremony was held in 752 after 7 years of construction. The shosoin is the treasure house that belongs to Todai-ji. The building is in the 'azekura (log-cabin)' style, with a raised floor. It lies to the northwest of the Daibutsuden. The shosoin houses artifacts connected to Emperor Shomu (701-756) and Empress Komyo (701-760), as well as arts and crafts of the Tempyo period of Japanese history. The treasures came from Japan, China and Persia which consist of excellent ancient art crafts like paintings, calligraphies, goldworks, lacquer-works, woodworks, glasswares, musical instruments and masks. There are also historical documents like Shosoin-monjo, documents related to the consecrating ceremony of Great Buddha, ancient medicine and so on. So it is valuable repository of history. The Kofuku-ji Temple, situated next to the Todai-ji Temple, was prosperous as a forerunner of "Buddhism for aristocrats" in the Nara period. Among the seven biggest temples of Nara, the Kofuku-ji Temple has developed through the closest relationship with the town of Nara. In 710, the Umayasaka Temple, the predecessor of the present Kofuku-ji Temple, was transferred from Asuka to the Nara capital by Fujiwara-no-Fuhito. Then, as a tutelary temple of the Fujiwara family, it extended its influence with the prosperity of the family. It was rebuilt several times after the fire. In 768, shrine buildings started to be constructed here by Fujiwara family. In the first half of the Heian period (794-1192), shrine buildings were completed on the same scale as they are today. After the Middle Ages, the belief was prevalent among commoners, which is shown by the fact that various-shaped hanging lanterns and stone lanterns known as "Mantoro" were mostly the donations from common people. The Shrine lies in a primeval forest of cedars and a kind of Chinese black pines. The brilliant vermillon edifices are beautifully contrasted with their surrounding greenery. Going through the first and second Torii gates, you can see a lot of stone lanterns standing on both sides of the approach to the shrine. Going on further, you will find the south gate on the left. The main hall is located among trees behind the gate. From the gate a corridor extends to the left and to the right. A great number of lanterns hung from the eaves of the corridor are producing an elegant atmosphere. This edifice used to be a part of the priests' living quarters of the Gango-ji Temple, and was reconstructed as its main hall (National Treasure) and Zen hall (National Treasure) in the Kamakura period (1192-1333). The temple has attracted commoners since the Middle Ages. Numerous stone Buddhas and folk materials were discovered in the precincts. Thanks to the grand repair from the 25th to 29th year of Showa (1950-1954), we can enjoy appreciating the temple structures at the time of the Kamakura period's reconstruction. In the storehouse are a small wooden five-storied pagoda (National Treasure), a wooden sitting statue of Amida Buddha, Chiko Mandala, an abundance of articles on folk belief, and so on. The establishment of the temple started in 680 with the wish of Emperor Temmu that Empress would recover from her illness. 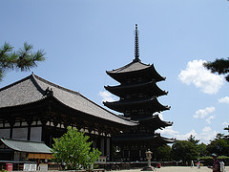 With the transfer of the capital to Nara, the temple was moved to the present site in 718. Two three-storied pagodas (the East Pagoda and the West Pagoda) are placed centering around the Golden Hall and Lecture Hall. The arrangement of the temple buildings is so unique that the style of this temple is called "Yakushi Style". A fire broke out several times and most of the buildings were burned down. The East Pagoda is now the only structure that was constructed at the time of the foundation of the temple. The other buildings including the Golden Hall were reconstructed, and finally in 1982, the West Pagoda was completed. The popular visiting course is to start from the station and begin with the Lecture Hall. Another course can be to go through the south gate and then visit the East Pagoda, the West Pagoda, the Golden Hall, the Bussoku-do Hall, Toin-do Hall,and the Lecture Hall in this order. This temple was founded in 759 by the Chinese Buddhist priest Ganjin Wajo, who, with the invitation of Emperor Shomu, came to Japan after going through all sorts of hardships. The whole temple, including the Golden Hall called "Tempyo-no-Iraka," the Lecture Hall and the Treasure Hall, still keeps its original appearance. The temple buildings are beautifully arranged, which shows us broad-mindedness of the people of the Tempyo era. Following properties are designated as Special Historic Spot or Special nntural Monument. The Heijo Palace was built in 710 as the center of Heijo-kyo Capital, which lasted for 74 years over the 7 successive reigns. The Palace was located in the northernmost area of the central Heijo-kyo Capital and, with an extended area toward the east, it had a total area of about 120 hectares. Containing the Daigoku-den and the Chodo-in for formal ceremonies, the Dairi as an emperors' residence, the To-in, and government offices with 8 ministries and 100 agencies, the Palace is considered to have been surrounded by mud walls and moats with a total of 12 gates, 3 gates being built in each direction. A continuous excarvation has been carried out by the Nara National Cultural Properties Research Institute since the 34th year of Showa(1959). Moreover, the "Suzaku-mon," or the formal gate to the Heijo Palace, and the "To-in" Garden, or the site of aristocrats' banquets and ceremonies, were restored and have been open to public since 1998. The highest peak of Kasuga-Hill is Mt. Hanayama (498m) and the unbrella shaped mountain east of Kasuga Grand Shrine is Mt. Mikasa. As this is a divine hill of the Kasuga Grand Shrine, the trees in the whole area of the hill behind the shrine have been prohibited from cutting down for more than 1,000 years. The hill is covered with a primeval forest of cedars, firs and cypresses. Rare animals such as a polypedatid and a kind of corbicula (Natural Monument) inhabit the hill, where it is dark even in the daytime because the area is located deep in the forest. From Kintetsu Nara or other stations around, you can walk or take a bus.